Climbing Mt. Norikura-dake (乗鞍岳), elev. 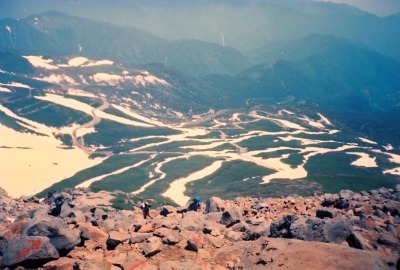 3026m, Japan's 19th highest mountain, in June 1993 was without question one of the most bizarre trips I've ever made to the top of a Japanese highpoint. Why? Because this mountain is one of the more popular areas in Japan for summer skiing (サマースキー), this trip was more of a ski trip than a mountain climbing venture. 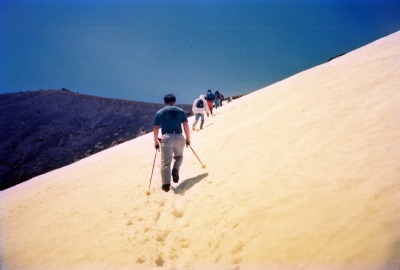 Along with 7 wild & crazy Japanese guys, on Sunday, June 27, 1993 we hiked w/ ski boots & poles to the summit and then skied down. Ordinarily, this would have been a fairly easy hike, as you only gain a little over 300m from the Tatamidaira bus terminal (畳平バスターミナル) & trailhead at elev. 2702m. But I can assure you, there was nothing "easy" about hiking this course in ski boots. Being from the HOT, southern U.S. state of Texas, where we don't even have one single ski area (actually, we only have few short mountains, and they’re out in the deserts of far west Texas), needless to say, my skiing ability leaves a lot to be desired. As a result, I crashed & burned a number of times skiing down the peak, providing quite a few hearty laughs to the other guys. From the Tatamidaira bus terminal (畳平バスターミナル), the trail goes around the south side of the Tsurugaike (鶴ヶ池) pond and along a service road past Mt. Fujimi-dake (富士見岳), elev. 2817m, and the road that cuts off to the right & goes over to the summit of Mt. 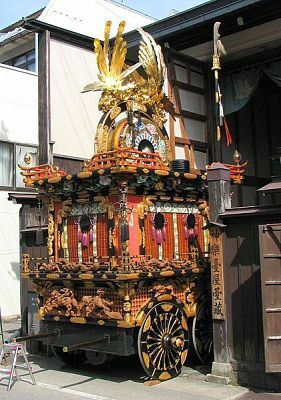 Marishiten-dake (摩利支天岳), elev. 2872m, where the old Norikura Solar Observatory (乗鞍コロナ観測所) is located. After a couple of kilometers of fairly level hiking, you’ll reach the Katanogoya mountain hut (肩の小屋), where the trail coming up from Norikura-kogen (乗鞍高原) ties in. From the mountain hut, you'll then follow a much steeper hiking trail, which pretty much parallels the Nagano/Gifu prefectural boundary, for another kilometer or so up to the summit. From Mt. Norikura-dake’s actual highpoint, which is called Kengamine (剣ケ峰), elev. 3026m, the views are truly spectacular in all directions, including the nearby Kita Alps to the north and the Chuo & Minami Alps to the southeast. But perhaps the best view is of the lone wolf Mt. Ontake-san, just a little over 20 km south, which together with Mt. Fuji are the only 2 of Japan’s 25 highest peaks that are not part of the 3 Japan Alps mountain ranges. From the summit, you can go back down the same way to the Tatamidaira bus terminal (畳平バスターミナル), or…… just ski down like we did. The pics in the collage below are a sampling of my photo album hosted at Flickr. Clicking on the collage will open up the album on a separate page, or you can view the entire set sequentially in the slideshow player below. I hope you enjoy them ! Click here to view all of my Mt. 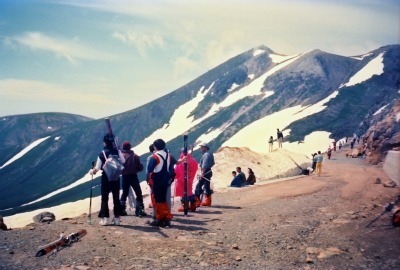 Norikura-dake (乗鞍岳) pics, taken June 26-27, 1993. Because Nagano Prefectural Highway 84 (長野県道84号乗鞍岳線) (more commonly known as the Norikura Ecoline (乗鞍エコーライン) road) reaches an elevation of 2710m as it passes thru the Tatamidaira bus terminal (畳平バスターミナル) area, it is the highest public road in Japan, and thus is only open from May 15 till Oct. 31 (from the Hirayutoge (平湯峠) gate on the Gifu side to the Sanbontaki (三本滝) gate on the Nagano side). And in order to protect the natural environment, private vehicles have been restricted year-round since 2003. So besides the option of hiking up great distances from the lower elevations, that pretty much limits your access options to shuttle buses, taxis, & bicycles to reach the Tatamidaira (畳平) trailhead. Shuttle bus service to Tatamidaira by the Alpico bus company is available from Norikura Kogen Kankou Center (乗鞍高原観光センター) from July 1 to Oct. 31 & Hirayu Onsen (平湯温泉) from May 15 to Oct. 31. This page shows an area map of these bus routes, along with more timetable & fare info as well as parking lot locations, fees, & capacities, including the Hoonoki bus terminal (ほおのき平バスターミナル). The Keio highway bus provides direct service from Shinjuku to Hirayu Onsen (平湯温泉) (bound for Hida Takayama) and reservations can be made online in English here. I understand bus service is also available from Matsumoto Station & Shinshimashima Station, in case you’re coming by train from Tokyo. I have no details on those, but if anyone has used these bus services, pls. educate me & I’ll be happy to add the info here. Since Mt. Norikura-dake (乗鞍岳) is yet another one of Japan's highest mountains that can be scaled in a weekend (we didn't leave Tokyo until after 10 pm Friday night) and we didn't ski down the peak until Sunday, we hung out on Saturday in scenic Takayama City (高山市) in Gifu Prefecture. Besides being famous as the closest major city to Mt. Norikura-dake (乗鞍岳), Takayama City is also well-known for its carpentry and some of the most popular Shinto festivals in Japan. These Takayama festivals use beautifully decorated (and tall!) festival floats, known as “yatais,” and one of the most interesting things we did that Saturday was to visit the Takayama Festival Floats Exhibition Hall (Takayama Matsuri Yatai Kaikan, 高山祭屋台会館), where these amazingly ornate & colorful floats are housed. We also paid a visit and worshiped at the very impressive Sakurayama Hachimangu Shrine (櫻山八幡宮), which is right across the street from the festival float hall, a pic of which is in my Flickr photo album above. 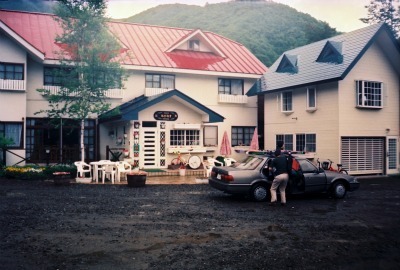 And I'd be remiss not to mention the great place we slept Saturday night, which even had an onsen. Pension Lupinus is conveniently located in the Azumi district of Matsumoto City in Norikura-kogen (乗鞍高原) right off the Norikura Ecoline (乗鞍エコーライン) road. Plus, they speak and do email in English. 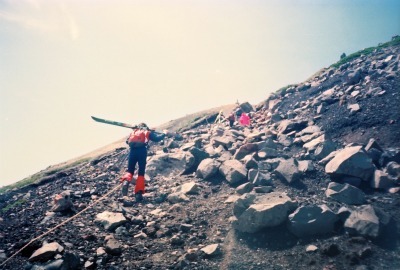 My June 27, 1993 climb of Mt. Norikura-dake (乗鞍岳) with 7 wild & crazy Japanese guys was without question one of the most bizarre, yet incredibly fun mountain climbing trips I've ever made. Because this trip was still fairly early during my tenure in Japan, it was a highly instructive cultural lesson in how Japanese men get together for a fun weekend & how the innate camaraderie and team spirit result in a very successful venture. From the summit of Mt. Norikura-dake (乗鞍岳), the views of the other several nearby peaks were truly stunning, & some of the best I've seen anywhere in Japan. I hope you found this page informative & do please stop by my site again soon. I also hope you'll take some time to check out some of the other Japanese mountain climbing pages, as well as other sections of my site. In the meantime, if you have any quick questions for me, or if you'd care to share your climbing story or offer some comments for other visitors, feel free to do so in the section below. Thanks for visiting !